Deficiency of essential minerals and vitamins in the body can lead to various disorders. Malnutrition is becoming a global problem which needs overcoming so as to save lives. Lack of protein in the diet leads to a condition Kwashiorkor. This disease is less common in the United States and countries where there is sufficient supply of food. The people in countries with less supply of food have to fight with diseases like Kwashiorkor. Kwashiorkor is a life threatening disease caused by protein deficiency. Malnutrition is never good for the body and it takes all energy from the system for other bodily functions making the muscles weak. Kwashiorkor is a disease that occurs when the body does not get enough protein. It is more common in Sub Saharan Africa as people are deprived of adequate food supply in the region. However, such cases are rarely reported in the United States and other parts of the world. Protein has a vital function in the body and it does provide energy for the muscle tissues but in case of its deficiency, the body steals protein from the muscle tissues for energy. Malnutrition can be deadly in many cases as the body gets deprived of essential nutrients. Kwashiorkor is caused by severe lacking of protein in the body. Protein is needed to repair cells and grow the body. Each and every cell of the body requires protein for its vital functions. Protein is essential for growth of children and during pregnancy for the baby’s growth. Apart from Africa, kwashiorkor cases are rarely reported in the United States and other parts of the world. There may be some cases only resulting from abuse, negligence, or fad diets. Underlying diseases like HIV can also become a cause for kwashiorkor as the body does not perform vitally. What are the Symptoms of Kwashiorkor? There are notable symptoms of kwashiorkor which should be treated as soon as possible as they may get worse if left untreated. The most prominent symptoms include diarrhea, fatigue, changes in skin color, damaged immune system, weak muscles, edema, irritability, inability to gain weight, and flaky rash, swelling of the ankles, feet, and belly. If a person is suspected with kwashiorkor, he may be checked for swelling or enlarged liver by the doctor. Furthermore, blood tests and urine tests will be performed to measure the protein levels in the body. The tests will measure overall health in terms of kidney function, muscle breakdown, and growth. The tests will include arterial blood gas, blood urea nitrogen, creatinine, potassium, urinalysis, and a complete blood count check. Kwashiorkor can be treated by adding more protein to the diet. An early treatment can save you from many symptoms and troubles later on. Patients are also given extra calories in the form of fats, sugars, and carbohydrates. 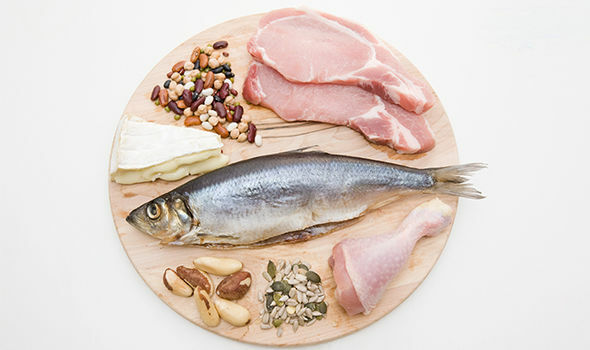 Such foods are given to provide the body with energy after which protein is given to overcome the deficiency. Foods are adjusted with calories slowly so that the patient’s body can adjust to the changes made. The body was deprived of essential nutrition for a long time which is why care has to be taken with dietary changes. Your doctor is more likely to recommend you multivitamins for long term to recover from any nutrient deficiencies. Are there any Risks and Complications of Kwashiorkor? The risks of kwashiorkor are permanent mental and physical disabilities. The disease should not be left untreated as it may lead to further complications and health risks such as coma or even death. How to Eat Right and Know Signs? Kwashiorkor can be prevented by eating the right foods. Having the right foods in the right proportion will save you from malnutrition. A person’s diet contains 10 to 35% calories from protein sources including seafood, eggs, lean meat, beans, peas, nuts, and seeds.